NairaLearn TV is a leading Digital eLearning, Technology, and News Platform. We are looking forward to recruiting talented individuals that will work together as volunteers to deliver high-quality Digital TV News. 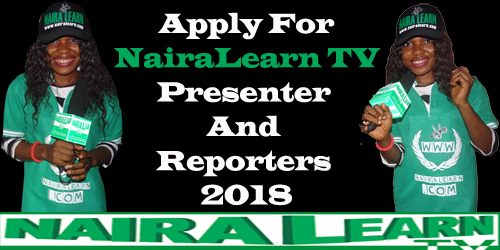 8 responses on "APPLY FOR NAIRALEARN TV PRESENTERS AND REPORTERS 2018"
I love the new development! sted to work as a nairalearn tv presentetnks .